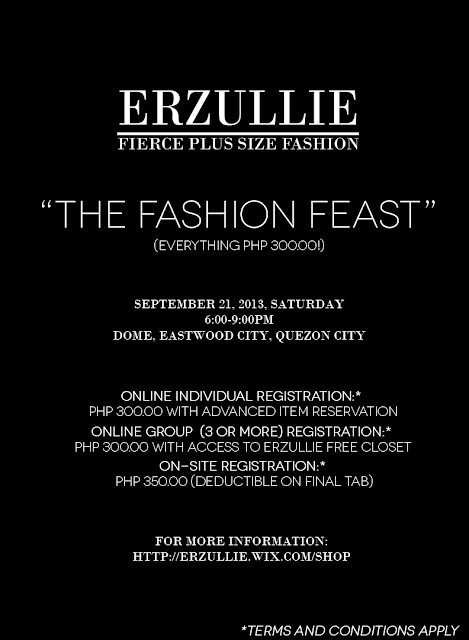 Erzullie Fierce Plus Size Fashion Philippines: PLUS SIZE EVENT: #THEFASHIONFEAST 3 DAYS OF REGISTRATION LEFT! PLUS SIZE EVENT: #THEFASHIONFEAST 3 DAYS OF REGISTRATION LEFT! To all the Erzulliestas that already registered, thank you very much for doing so! We will see you ladies at the event! The sale event is set to happen on September 21, 2013, Saturday (6-9pm) at DOME, Eastwood City, Quezon City.